This is just a selection of the profile that appeared in The Scranton Times-Tribune. Read the entire profile here. Growing up in a suburb of Buffalo, New York, Maria Marinucci was surrounded by strong women, including her outspoken Italian mom and three sisters. She was an academic, a thinker and an outgoing athlete who was always busy and on-the-go. It makes sense then, that Marinucci eventually came to be the director of the cross-cultural centers at The University of Scranton, where intersectional interests of students converge. Marinucci guides students in fighting oppression and injustice, examining privileges and disadvantages, and finding opportunities for themselves and others. Marinucci earned a bachelor’s degree in psychology with a minor in educational studies from Colgate University in New York, and she went on to get her master’s degree in student affairs in higher education from Colorado State University before making her way back east to work in residence life at a small school in Vermont. She was drawn to a job at U of S five years ago to be closer to her family, who still live near Buffalo, but she found a community she has grown to love and be inspired by in Scranton, where she now resides with her partner, Christine. Marinucci initially worked in residence life at the university, but she transitioned to her current job as director of both the Jane Kopas Women’s Center and the Multi-Cultural Center, achieving her goal of connecting with students through learning as well as life outside their classrooms. The tasks of Marinucci’s job vary, she said, but generally, the cross-cultural centers educate on topics of power and privilege and work for justice, equity and inclusion, all of which fall in line with the university’s Jesuit mission, she added. In the Jane Kopas Women’s Center, meanwhile, all these things are done within the gender spectrum. 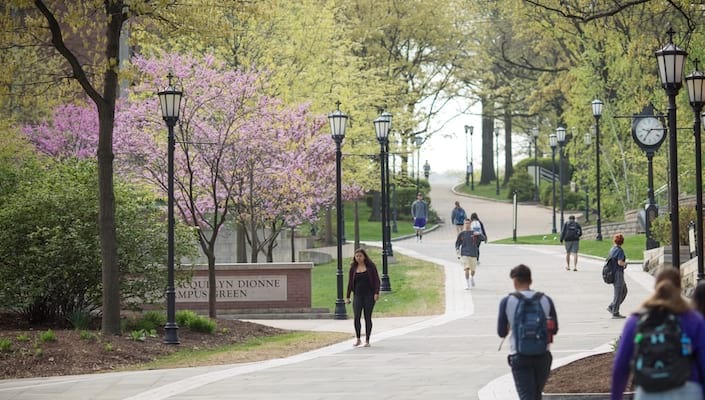 Marinucci frequently hosts awareness events; engages in anti-violence work, especially sexual harassment; and helps students understand and find their own voice. She teaches self-advocacy, examines body image, and creates a community where they feel empowered to intervene when they see inequality, she explained.